During investigations of the site of the ruined Crusader Church of St. Maria Latina for the construction of the Church of the Redeemer in 1893 a huge wall was found under the ground running in east-west direction. Many were convinced that it had to be a part of the long-sought after "Second City Wall" of Jerusalem from the time of Jesus. 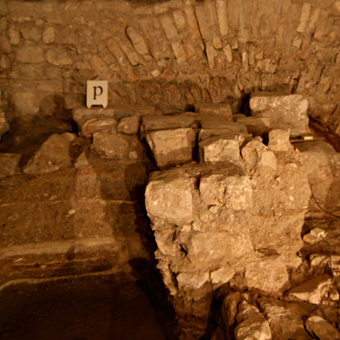 In 1970, while inspecting the foundations of the Church of the Redeemer for a comprehensive renovation of the church, this wall was discovered again. The GPIA was then able to make an accurate dating of the wall with modern archaeological methods. For this purpose, a roughly eight-meter deep shaft was dug vertically down to the bedrock directly on the wall. This led to a quarry that was used until the 1st century BC - the time of Herod the Great. Over the quarry were two layers formed at different times. The first layer consists of three horizontal bands of loam that was washed in by winter rains over a period of more than one hundred years, from the turn of the millennium until the establishment of the city Aelia Capitolina in around AD 135. The area of the former quarry had apparently been used as a garden and pasture. A stone wall can also be seen in the north side of the sounding. The ceramic finds from this layer extend into the first century AD. The second layer consists of rubble and was filled into the former quarry from the south in order to level out the land. The east and the west wall of the shaft show the direction of the fill. This layer has a tremendous thickness of about 5.50 m and came about when the new city Aelia Capitolina was built in around 135 AD by the Roman Emperor Hadrian. The debris came from the destruction of Jerusalem in 70 AD. It contains many findings from the Herodian period and coins dating to the first Jewish revolt against the Romans, before the destruction of Jerusalem. It was clear from the sounding that the wall that had been seen as a section of the "Second City Wall" from the time of Herod, had actually only been built on top of the fill from around 135 AD. This proved that it could not be the "Second City Wall" from the time of Jesus. The wall consisted in the lower part (uncut stones) of foundation stones of houses dating from the 2nd century BC and in the upper part (cut stones) south of a retaining wall of the Forum to the south of the Holy Sepulchre (4th century AD). The exhibition shows some of the scattered objects found in the sounding. The oldest finds date from the Iron Age (8th and 7th centuries BC), the era of the Old Testament kings. These include, for example, fragments of figurines that probably represent fertility idols and were often present in households. Handles from Iron Age ceramic vessels were also found in which royal stamps were embedded. In the sounding were also many coins from different periods, some of which are presented in the exhibition. These and many other examples tell of the everyday life and the history of ancient Jerusalem.